This shot came up in my Twitterfeed yesterday evening and I was immediately struck by its simplicity yet it so strikingly says so much about the current predicaments of our time. "Future Penguin Modern Classics cover" @Mattleys proclaimed as he retweeted the photo. 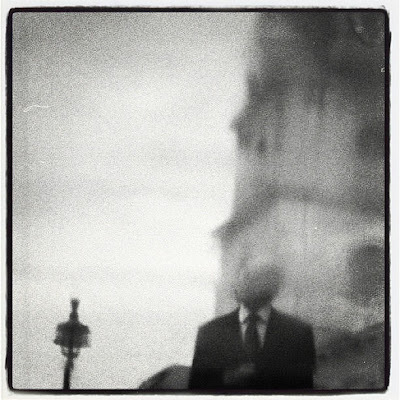 The eerie image of the non-descript banker with "old London" behind him - the lamp-post, the towering white stoned building - was taken by London-based documentary photographer Darrell K Morris. "It was taken outside the National Gallery after a storm. I take a lot of street scenes and had been sheltering from said storm whilst photographing the demo," Morris explains. "A group of businessmen were just going past and he was lagging behind." The image of The Faceless Banker may go on to become the future cover of a Penguin Modern Classic or not, but it definitely says more about modern times than any of those photos of the riots early last summer, or images from the student protests because it doesn't really say anything at all, it is our impression of the times we are projecting onto it, our feelings of the times and after all, those feelings are what we will remember most vividly. However, I do hope that somehow Penguin do see this and Morris gets that Modern Classics cover, that would be great wouldn't it?